These decadent truffles are wonderfully messy and good fun for kids to help roll and decorate. They'll love getting their hands chocolatey – it's a good idea to have aprons at the ready to protect Christmas outfits. No finger-licking till the last truffle is rolled! Heat the crème fraîche in a heavy-based saucepan until melted and almost boiling, then remove from the heat and stir in the chocolate, butter and vanilla extract. Allow to melt, stirring occasionally, until the mixture is smooth and glossy. Stir in the ginger, figs and cinnamon and transfer to a bowl. Leave the mix to chill in the fridge for about 3 hours; by then it should be firm enough to shape into balls using teaspoons or cool hands. Imperfections look charming, so there's no need for perfect spheres. Roll the truffles in cocoa powder and chopped nuts until evenly coated. Leave on non-stick baking parchment for about 2 hours until set. 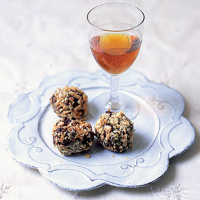 Wines for Santa: Rich flavours need a dessert wine with bright fruit and acidity. The great reds of the Roussillon are magical.